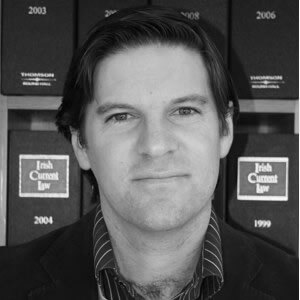 Lughaidh Kerin join us from the National University of Ireland Galway, where he had held the position of Lecturer in Law since 2009. He graduated with an honours Bachelor of Arts degree in 1997 and an honours Bachelor of Laws degree in 1999 from the National University of Ireland, Galway. He spent the academic year 1997/1998 as an Erasmus student studying at the Katholieke Universiteit Leuven, Belgium. He then went on to successfully complete his Masters in Law at the University of Edinburgh, Scotland in 2000, where he read Commercial Law, European Union Law and Arbitration Law. He trained as an apprentice solicitor to Desmond J. Houlihan Solicitor and was admitted to the Roll of Solicitors in 2003. He subsequently practiced as a solicitor with Desmond J. Houlihan & Company in the West of Ireland. He successfully completed the New York State Bar Exam and was admitted as an Attorney and Counselor at Law in the State of New York in June 2004. Lughaidh has also been admitted to the Roll of Solicitors in England and Wales. He joined the School of Law at NUI, Galway in September 2009. Lughaidh Kerin was a member of the board of the South West Mediation Services (Cumann Seirbhís Idirghabhála an Iar-Dheiscirt), which is a not for profit mediation services organisation promoting and providing conflict resolution and mediation services. Further information is available at http://www.swmediationservices.org/ He is also on the Chartered Institute of Arbitrators, Irish Branch, Young members' subcommittee. He was appointed as an Arbitrator to the panel of Arbitrators of the Gaelic Athletic Association Dispute Resolution body, Disputes Resolution Authority (Córas Eadrána), in 2011. He created a new yearlong module entitled "Advanced Mooting and Advocacy", which was approved by the School Quality and Curriculum Board. The mediation portion of my Advance Legal Skills (ALS) module was awarded "Outstanding New Mediation Program" by the InterNational Academy of Dispute Resolution (INADR) in 2015, following the inaugural participation of a team of Middlesex University ALS students in the 14th Annual International Law School Mediation Tournament which was hosted by the BPP and UCL in London. Inaugural participation in the UK National Negotiation Tournament. I was nominated for 'Most Empowering' Award in the MDXSU Teaching Awards 2015. Lughaidh Kerin's areas of research include: Dispute Resolution in its many and varied incarnations; Legal & Business Ethics; Clinical Legal Education. In particular Lughaidh is interested in Mooting and has organised and coached teams for a significant number of national and International competitions both in Ireland and in the UK. Organised and moderated in association with the UNESCO Child and Family Research Centre, NUIG and the Irish Centre for International Family Mediation a day-long conference on Mediation in Cases of International Family Conflict and Child Abduction with Irish and international speakers and experts in the field and representatives of the EU Network of International Family Mediators. Joint organiser of the inaugural day-long conference for the new LL.M. in International and Comparative Disability Law and Policy in association with the Employment Law Association of Ireland. Joint organiser of a mediation boot camp which ran over 3 days with Liam Moore – CPD Board, Ennis. This mediation camp was aimed at upskilling newly qualified mediators. "Back to the Future: Negotiation and mooting, blasts from the past – keys to the early years of clinical legal education in the 21st Century" (Part II) – 12th International Journal of Clinical Legal Education Conference, 15–18 July 2014 Palacký University, Olomouc, Czech Republic. This paper built on my paper which I had delivered a year earlier in Australia. "Back to the Future: Negotiation and mooting, blasts from the past – keys to the early years of clinical legal education in the 21st Century" – Common Ground Sharing Across Models of Clinical Legal Education – 11th International Journal of Clinical Legal Education Conference, 12th Australian Clinical Legal Education Conference, 16–18 July 2013 Brisbane, Australia. Co-authored with Sabine Walsh on Kluwer Mediation Blog; "Conference Report: Mediation in Cases of International Family Conflict and Child Abduction", on the 5th July, 2013. European Research Project – "Menu for Justice"
A member of a major EU-funded research network: "The Menu for Justice Project", which is led by the University of Bologna, Italy. The Project had 50 associate institutions in 30 European countries; it aimed to develop a common legal and judicial training curriculum for law students, lawyers and judges. This culminated earlier last year with the submission of the final report to the European Union and its subsequent publication as a two book volumes entitled "Legal Education and Judicial Training in Europe" and "Towards innovation in Legal Education" by Eleven International Publishing (2013).